“Keeping a Wet Edge: A Retrospective of the Abstract Work by Rick Vian” & “Detroit Abstraction: Featuring 41 of the Most Noted Abstract Artist with ties to Detroit”. The experience of being alone in the bush, as we call it in the far north of Michigan’s Upper Peninsula, deep in the thicket of the woods, is a tricky business. From immobilizing awe over its beauty to a vertigo over its map-less chaos, a walk in the bush can wreak psychic havoc. 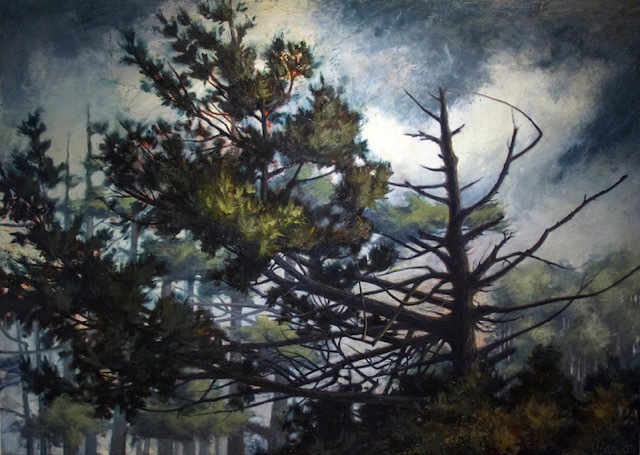 The current retrospective of Rick Vian’s painting at the Janice Charach Gallery offers a marvelous mirror of Vian’s engagement with the painting of trees in the bush over the past fifteen years. But first before finding himself in the bush of the Upper Peninsula, Vian was a worker, an industrial painter (it’s probably where his no-nonsense work ethic comes from) literally painting factories—the infrastructure of gas, water and electrical lines, the dangerous machinery of industrial production, — and living the inherent design and experiencing the drama of industry. 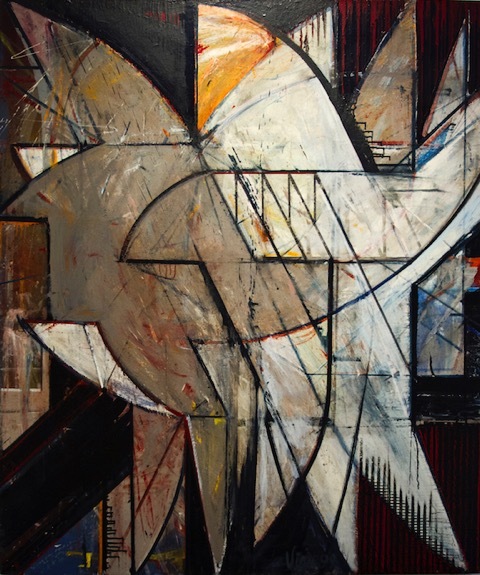 There are a few paintings in the current exhibition that took inspiration from that time and they explore with dramatic shading and coloring, with scumbled surfaces and jagged lines, the interconnected and interlocked spaces of a unique and almost cartooned or animated geometric abstraction. They don’t much look like any geometric abstraction from art history though they might suggest kinship with the Russian Constructivists. 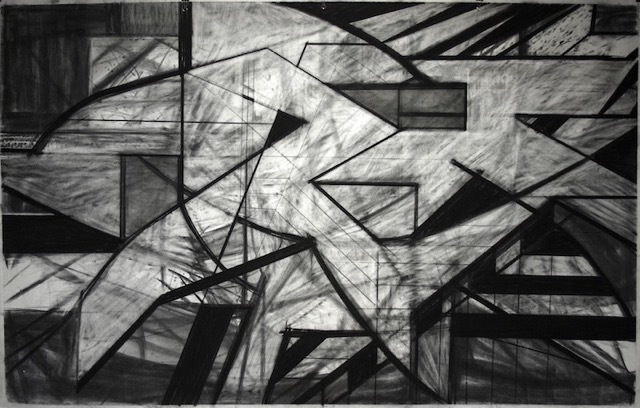 “If You Only New,” 2004, a charcoal drawing, dramatized with smears and layered palimpsests and composed with the triangular stencils of drafting tools, looks gothic in its theatrical play of prime geometric shapes. “Nice Condition,” 1999, carves figurative contours out of classic blade shapes such as intersecting ellipses and truncated spheres, dramatizing the edginess of the industrial landscape. Rick Vian, “Nice Condition”, Oil on Canvas, 48 x 40″, 1999 All images Courtesy of Glen Mannisto, and the Artists. These earlier geometric abstractions set us up for the big hit of the retrospective and his latest project which is the push/pull relationship between Vian’s figurative and abstract painting of nature. He seems to have turned away from his industrial abstraction and industrial life (he quit the commercial/industrial painting gig) to paint nature. Exploring the wilderness of Northern Michigan’s upper peninsula, where he built a rustic camp in the woods, Vian has engaged the forest and its parts, the tree. Translating his early explorations of the grid, that classic modernist notion, and the physics of sight, Vian has alternated between strictly realist renderings of the forest and a fervently energetic expression. His paintings have become a moment of conscious realization of both the forest and the painting as a signing of that relationship. “Stormbreak,” 2005, a dramatic and acutely stark representation of the existential state of a skeleton of a tree is a haunting and certainly metaphoric description of the vulnerability of that tree. In a conversation, he said “I have painted it many times. Its right off Lake Superior’s Keweenaw Bay just past Baraga.” Lest we say Vian has painted it so often that he has almost become its biographer and in that there is the best characterization of a regional artist as a partner and caretaker of the local. One senses a devout relationship with that tree and in the radical shift back, again, to his abstracting of the bush, there seems to lead to a reading of the forest as an emancipating energy and scripted choreography of the forest. 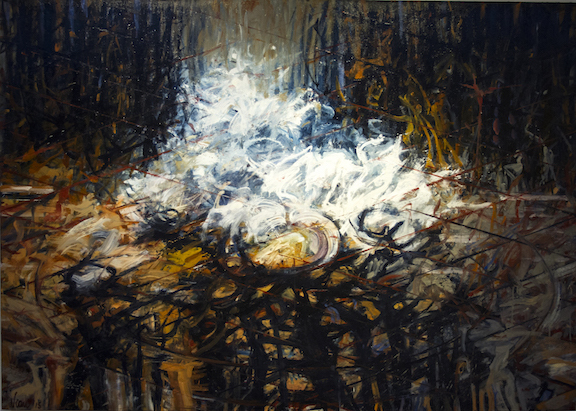 This dramatic relationship infects and determines most of the remainder the current work typified by “The Gathering Pool,” 2010, which “gathers” the surrounding forest or audience of dark shapes, of abstracted squiggles, smears and vertical black shadow-like slashes (figures?) into a focus of brilliant light or frothy foam. In contrast to the surrounding darkness, this brilliant moment is a crescendo of light, perhaps a symbol of spiritual transcendence gleaned from the dark bush. Vian pays homage frequently to his interest in both Italian Renaissance painting, which employed color and brilliant light to dramatize Christian scripture, and to Buddhist, Hindu and Islamic disciplines which use the mandala to diagram the cosmos or in Jungian psychology the unity of the self or personal identity. At the same time, he has kept an eye out for a deep, perhaps objective structure, a former preoccupation of his painting, and found a three-dimensional grid suggested in the “The Gathering Pool” by a faint network intersecting lines. As a disciplined and investigative sojourner, Vian’s bushwhacking has even led him to study the language of the native Ojibway people entitling some of the painting in the Ojibway language which one senses gives a sympathy to the surrounding landscape and to its original inhabitants and interpretors. As an extraordinary compliment to his own paintings Vian curated “Detroit Abstraction: Featuring 41 of the Most Noted Abstract Artists with ties to Detroit,” a remarkable collection of painting, sculpture, ceramics, and fiber works revealing the profound depth and width of the Detroit’s artistic landscape and of course another testimony to the sincerity and fidelity of Vian’s overall artistic project. There is too much to say about the phenomena of abstract art especially in this post-digital age, but quite simply one is overwhelmed with the diversity of ways of seeing and of the use of materials and processes that are represented in Detroit. 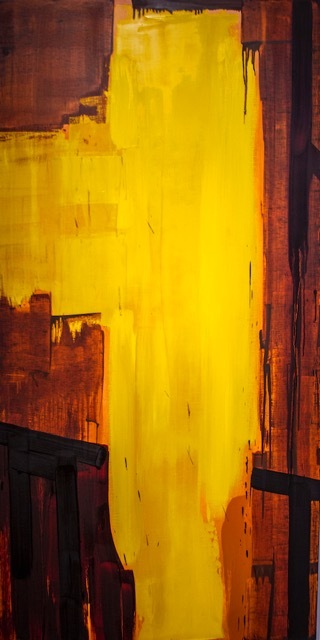 The stereotyped mainstay of abstract art is painting and the standouts in Detroit Abstraction don’t surprise: Holly Branstner’s stunning “Bracket” is composed of an elongated rectangle with a monolithic, effortless stroke of brilliant yellow with strokes and drips of dark bloody reds. 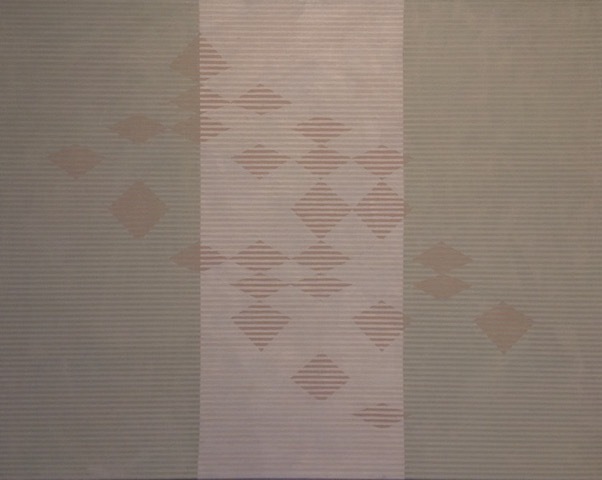 At the other end of psychic spectrum is Janet Hamrick’s smaller oil on canvas, “Undulating Drift,” a subtle reckoning of three panels of alternating stripes in a quiet pallet of taupe and mauve overlaying a series of diamond shaped rectangles. It is excruciatingly subtle and beautifully nuanced and impossible to describe. That’s why it’s a painting. It goes like that: from explosive abstract expressionism to minimalistic painting strategies, from biomorphic and surrealist automatism, to action painting, and the whole wonderful gamut of assemblage wall reliefs composed of cement, wood, metal, glass to cubist formalist sculptures, kinetic whirly gigs and textile hangings, ceramic vessels and Japanese inspired altar-like constructions. The explosion that was/is Detroit’s art scene is beautifully realized in Vian’ s deft selection of artists. The diversity of materials and processes speaks of the battle against encrusted formalism that has been a preoccupation of Detroit artists and is a fulsome reminder of the tremendous will and passion of this place-in-the-straits to give shape to the world. Vian’s paintings occupy the first floor of the spectacular Janice Charach Gallery and the Detroit Abstraction exhibition occupies the second floor. Both are stunningly installed in this amazing space that is part of the Jewish Community Center campus. It is a revelation even to the most experienced art appreciator to see the quality, complexity and integrity of the Detroit’s scene. The artists included (and Vian bemoaned that there wasn’t room for others he had selected) in the Detroit Abstraction exhibition include: Diana Alva, Anita Bates, Robert Bielat, Holly Branstner, Coco Bruner, Jim Chatelain, Terry Lee Dill, Barbara Dorchen, John Egner, Gary Eleinko, Todd Erickson, Marcia Freedman, Brenda Goodman, Dennis Guastella, Carole Harris, Janet Hamrick, Al Hebert, Meighen Jackson, Lester Johnson, Dennis Jones, Ray Katz, Brian Lacey, Addie Langford, Charles McGee, Allie McGhee, Robert Mirek, Erin Parish, John Piet, Tom Phardel, Sharon Que, Curtis Rhodes, John Rowland, Douglas Semivan, Gilda Snowden, Robert Sestok, Dayton Spence, Ron Teachworth, Nancy Thayer, Russell Thayer, Lois Teicher, Albert Young. Rick Vian will talk about his work and the Detroit Abstraction exhibition in the Janice Charach Gallery December 4th at 1:00PM. 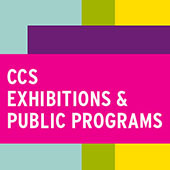 The two exhibitions close Thursday December 8th at 8:00PM. 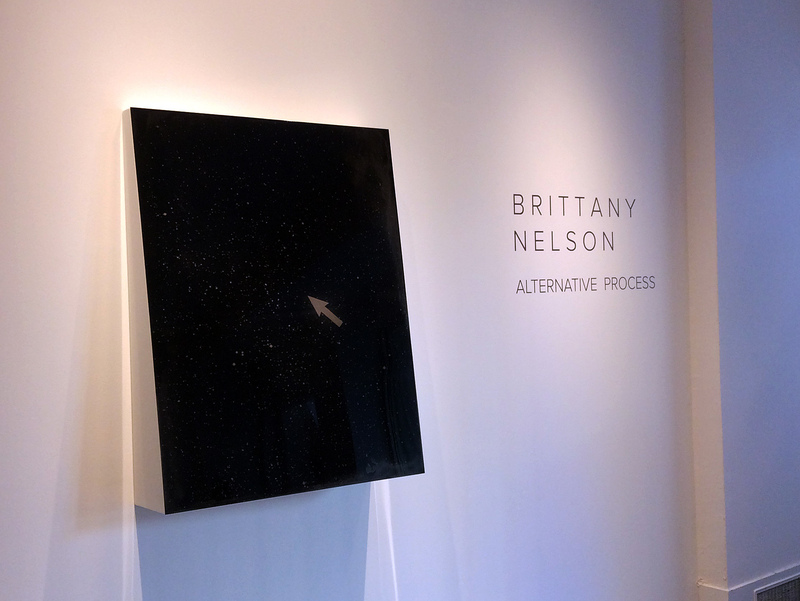 Alternative Process, work by Brittany Nelson, and Chasing Venus, work by Susan Goethel Campbell and window installation by Ellen Rutt. The newest pairing of artists on view at David Klein Gallery’s Detroit space, photographers Brittany Nelson and Susan Goethel Campbell, engage history, science, and formal beauty in ways that reveal what ancient knowledge and antiquated technology can tell us about the visual stake we hold- and the tissue-thin mastery we take for granted- over the natural world. Brittany Nelson’s collages of “science graphics” and 3D Photoshop forms onto tintype prints (one of the earliest photographic mediums) follow a simple, clever formula of overlaying heavy, historic substrates (thickly mounted tintype photographic plates that warp out of foursquare precision and are often hung at a slight angle to the wall, visually reinforcing their whiff of memento mori and the slow melt of age) with graceful, feather-light graphics culled from contemporary modes of visual shorthand- graphics, grids, algorithms, flowcharts. These two modes of information capture dance uneasily with one another on Nelson’s dark grounds- there’s a dissonance to seeing these fleeting, fast-moving graphics inlayed on such iron-clad media, designed to catch and house a physical shadow of a once real, living, or tactile thing. Nelson’s work resurrects something of the uncanny magic photographic technology once held for people in the Nineteenth Century- its strange promise of immortality, its mind-bending harnessing of modern science. 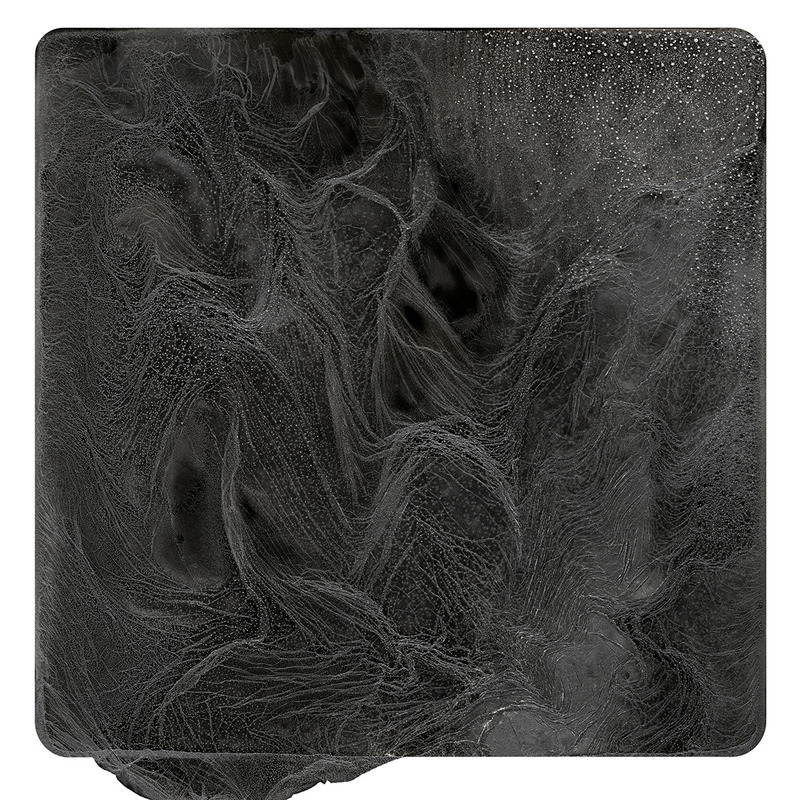 The dark, atmospheric voids characteristic of tintype photography find a visual dialog with Susan Goethel Campbell’s Chasing Venus. 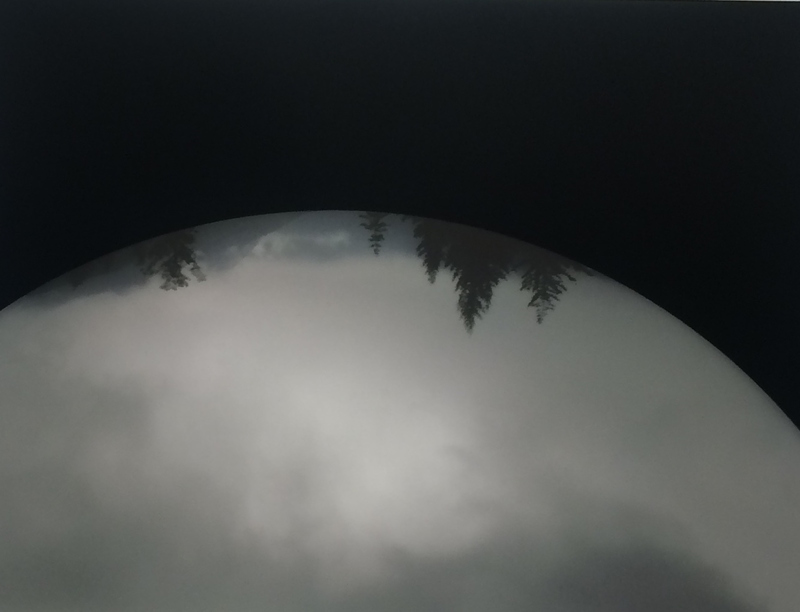 This work documents, in film and photography, a patch of sky over the Rocky Mountains in Alberta, Canada, during the Summer Solstice, when the moon appears to be following Venus across the sky. Campbell’s work documents, in solemn stills and dizzying, feather-light films, the turning of the planet from day to night, toward and away from an incredible full moon. 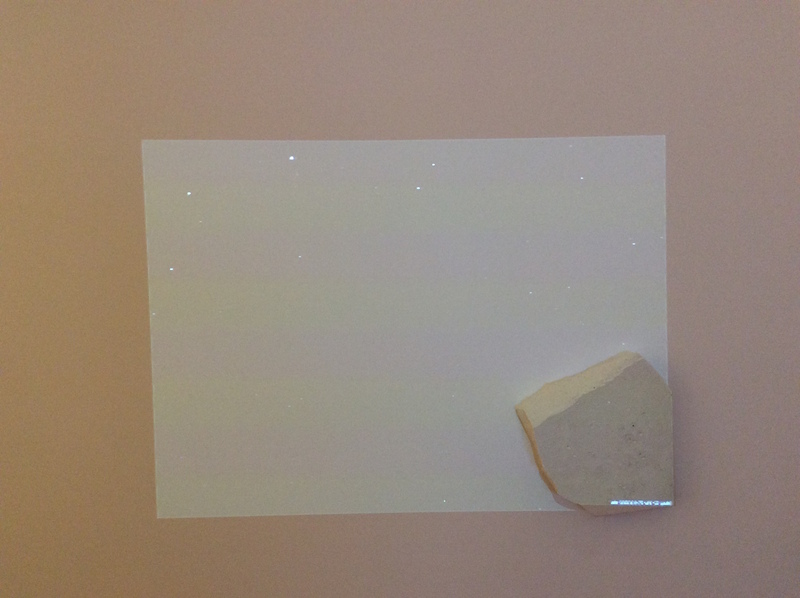 The faceted surfaces of mountainous landscape, vast sky, and brilliant earth (her installation includes visuals that are nearly impossible to photograph, a video projection of time-lapse sky-scape dancing on a wall mounted with a chunk of granite, a pile of glittering mica poured onto a shallow shelf that casts uncanny tones of light onto every surrounding surface) utilizes straightforward modes of visual documentation to hint at the sublime- crystalizing, in moment-to-moment documentation, both our concept of linear time and the sublime impossibility of conceiving the clock of the universe. The kernel that unites Nelson and Campbell’s work in these dark, visually haunting twin exhibitions might be an “exposure,” manifested in the beauty and opacity of both artists’ combinations of technique and content, of the failure of such analytical, documentary methods to capture eternity. Watching the sky and drawing it into visual rhymes with small, shiny objects, as the ancients did, distilling the visible into frozen shadows, as more recent generations did, or collapsing the world into descriptive algorithms, as we do now, may, or may not, bring us any closer to a true understanding of the reason we are here, or why we’ve been given these abilities. Alternative Process and Chasing Venus do not attempt to answer this question- they cross-pollinate materials to broaden, deepen, and beautify its scope. Also on view is a colorful, lively installation by Detroit-based, multi-disciplinary artist Ellen Rutt. Rutt’s window installation provides a vibrant counter-balance to the darkly vibrating grounds and documentary atmospheres of Nelson and Goethel-Campbell’s work. 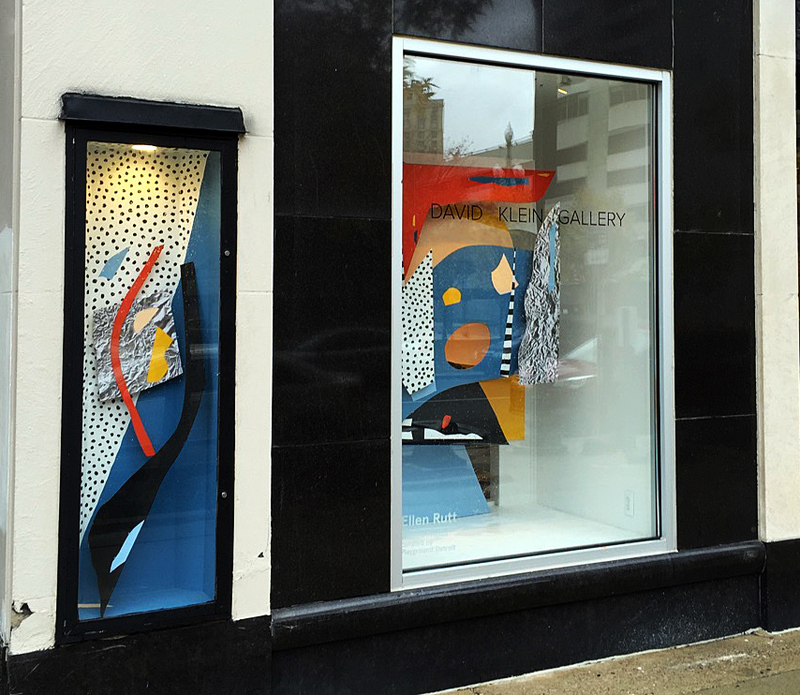 Alternative Process, work by Brittany Nelson, Chasing Venus, work by Susan Goethel Campbell, and Ellen Rutt’s window installation is on view at David Klein Gallery Detroit through December 17, 2016. Caledonia Curry (tag name Swoon) seems intimately aware of the ephemeral, fragile nature of both the human body and human endeavor. This sensibility weaves through all of her bodies of work, which make up for the degradability of their materials with iron-clad social consciousness and fierce political engagement. Curry first gained attention on the global art scene for her large scaled, lyrical street art prints, which, like her work at Library St Collective, engage with the figure overlaid with gorgeous lacework of iconic decorative flourishes and symbols. Curry would scout out locations for her prints, then install them, on walls, lamp posts, and other architectural surfaces, using wheat paste. These delicate cut-paper and print collages are not meant to last forever- they fade away, gently and gradually, like distant memories. To Curry, physical immortality of work is beside the point- this seems unusual, given the highly formal, decorative nature of her constructions. What such highly developed technical skill and labor intensive process is meant to foster is less reverence for the made object itself than a holding of space for a new perspective, a chance to recontextualize one’s relationship with place, with symbolism, with one’s own identity. 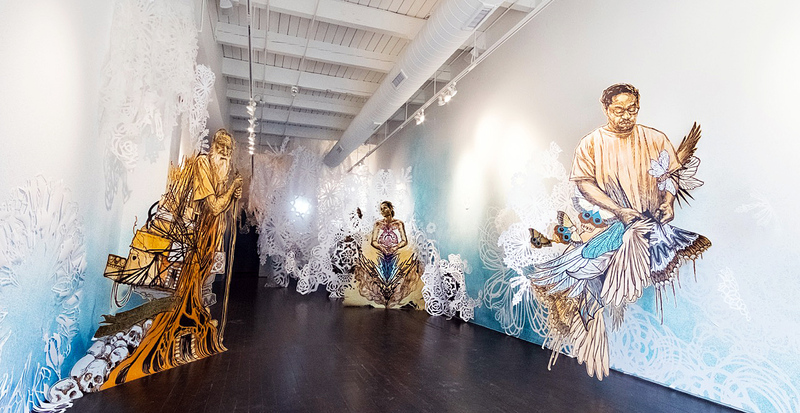 The same curious mixture of preciousness and ephemerality finds its way from Swoon’s street art practice into Curry’s site specific installation at Library St Collective. As lovingly wrought and beautifully realized as Curry’s life-sized figurative prints and elaborate cut paper confections are, they are installed with no greater measure of preciousness or economic value than her wheat pasted public works. Curry’s figurative cut out prints hang suspended from strands of fishing line, freed from the relative safety, and canonical indexing, of traditional wall installation. They move in the breeze- they’re equally visible from front and back. Curry’s incredible paper cut-outs, executed in black and white and resembling every beautiful, lace-like form a viewer can call up, from snowflakes to double helixes to Celtic knot work, drape freely from the gallery’s ceiling and dangle, like the figure cutouts, from strands of fishing line, inviting touch, uncannily mimicking the slight movements of sentient life. The heaviness of Curry’s concept for her site specific install at Library St is what grounds these floating works. Taking the narrow, tunnel-like structure of the front part of the gallery as inspiration, Curry is attempting, with The Light After, to recreate for the viewer her own narrative of a phenomenon known as “the empathetic death experience.” Curry encountered this phenomenon in a dream of a space filled with falling snow and “blossoms of light,” during which she felt that her mother had died. Upon awakening, she discovered that her mother had, indeed, passed away. 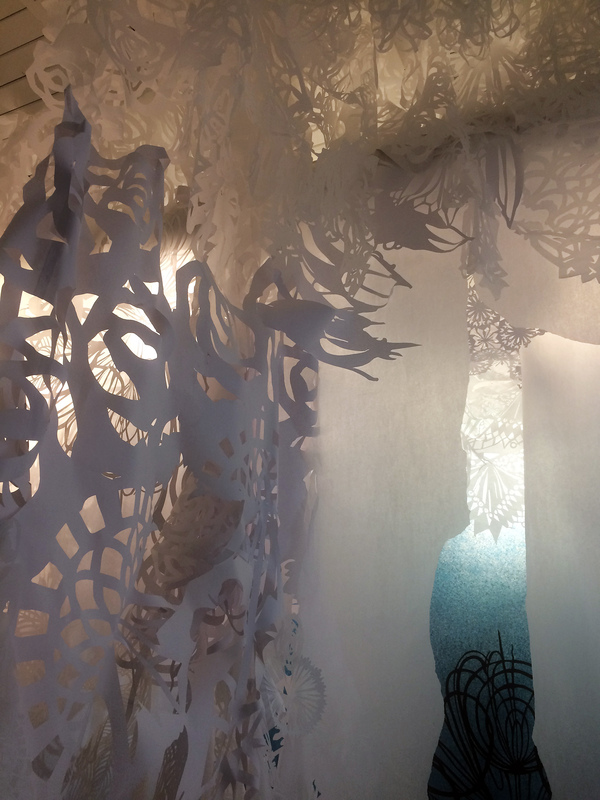 The snow-blossom motif of Curry’s installation occupies Library St.’s space as a tunnel of atmospheric light similar to those described by people who have had near-death experiences. Dispersed around this bright, ungrounding fairyland are Curry’s life-sized figurative prints which, despite their ephemeral construction, nail the viewer with quietly appraising or imploring gazes, each taking the form of a step on the initiation path toward death. 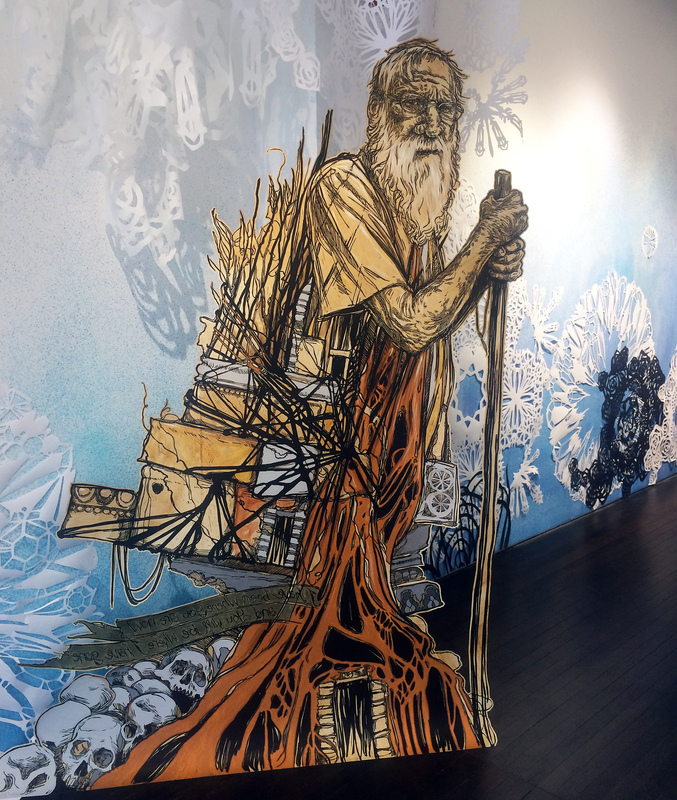 Curry’s figures are iconic- an old, bearded hermit leaning on a walking stick, his lower body morphing into ramshackle architecture which crumbles, at his feet, into a profusion of skulls. A heartbreaking double image of a woman filled with youth and vitality, holding a baby, while her forward-projected shadow looms behind her, emaciated, rigged up with oxygen tubes, her eyes engaging the viewer’s in abject, human terror of proceeding down the very tunnel that surrounds her. Curry takes the viewer through this legendary tunnel, which leads into a stark hallway painted in black and white geometric and organic forms- a nice visual metaphor for the space between the end of the tunnel and what comes after- into the gallery’s larger, airier back room or, as Curry titles it, “The Meadow.” The figurative prints in The Meadow aren’t allegories of death, but of rebirth- the color scheme of The Meadow is warmer, more organic, the 3D elements more tactile and sensual- piles of green velvet take the place of the ethereal cut-paper hangings within the tunnel. Mother-child pairings and figures surrounded by simple, ancient symbols of life and birth- paisleys, triple knots, spirals- gaze invitingly out or, more often, appear turned inward, eyes closed, in a private ecstasy of union with the life-power of the universe. There’s an uncanniness, a formal directness, and a powerful combination of personal and political narrative to Curry’s work that makes it difficult to contextualize in contemporary studio practice. The bald allegory and mirror-image rendering of her figure-prints awakens the viewer to the power of such imagery as expressed in every layer of our society, from religious painting to Chuck E. Cheese animatronics- all of them evoke the same frisson. Curry’s work reveals why this is so. Confronted with our own image reworked into symbolism, we begin to examine the foundations of universal truths- birth, death, spirit, the afterlife, the sentience of so-called inanimate objects- with the understanding that these truths emanate from our own bodies. Our bodies are ephemeral. What we can do with them, change with them, what we can leave to succeeding generations, is eternal. It is this truth that forms the kernel of Curry’s work in every medium and context that she engages. 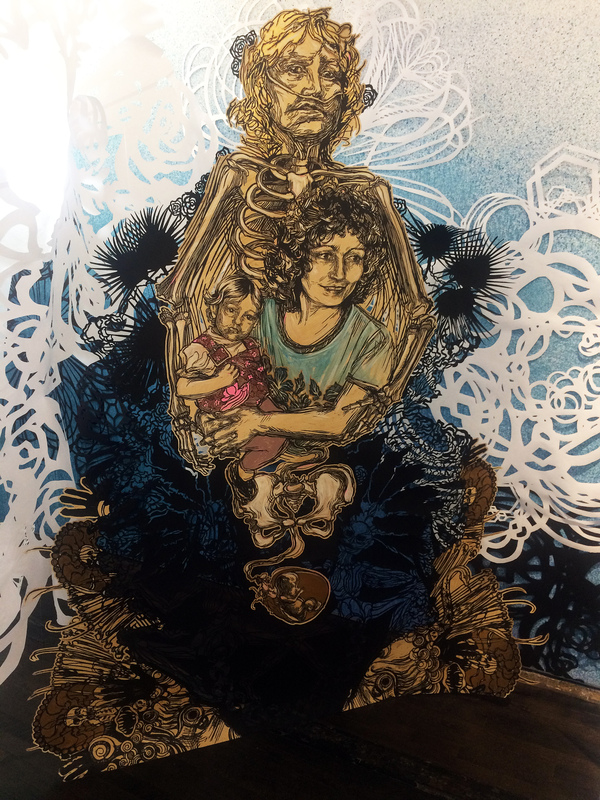 “Swoon- The Light After” is on display at Library Street Collective through November 26, 2016. Photography at night has been around since the late 1800’s when photographers were experimenting with exposing a variety of sensitive chemicals to light, first on plates by Louis Daguerre, followed by salt prints on paper by William Talbot. Later in the early 1900’s Alfred Stieglitz began working at night, and in 1932, Brassai published Paris De Nuit, a collection of black and white photographs of the streets of Paris at night. 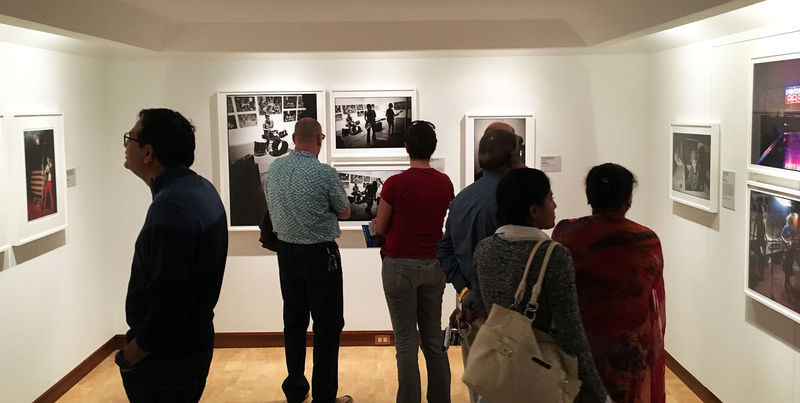 For the purpose of this review, this writer will draw a distinction between the journalistic photography (mostly the Detroit music scene) and focus on the art photography in the exhibition. With a Guggenheim grant in his pocket, Robert Frank bought a used Ford in June of 1955 and began a 10,000-mile journey around the United States. 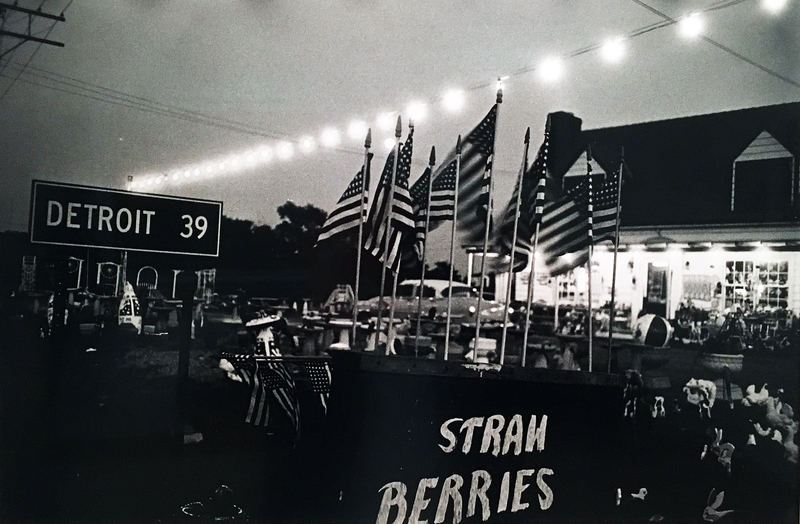 Detroit was one destination where he stayed long enough to capture images from Belle Isle to this Romeo strawberry stand at night, illuminated with a string of party lights. After developing and making contact sheets from 760 rolls of black and white Tri-X film, 83 images would be enough to make The Americans, first published in Paris, then eventually the United States. Frank didn’t set out to address the issues that faced the country, but inadvertently became an incontestable witness, using his 35mm Leica Rangefinder, to the solitude of American society. 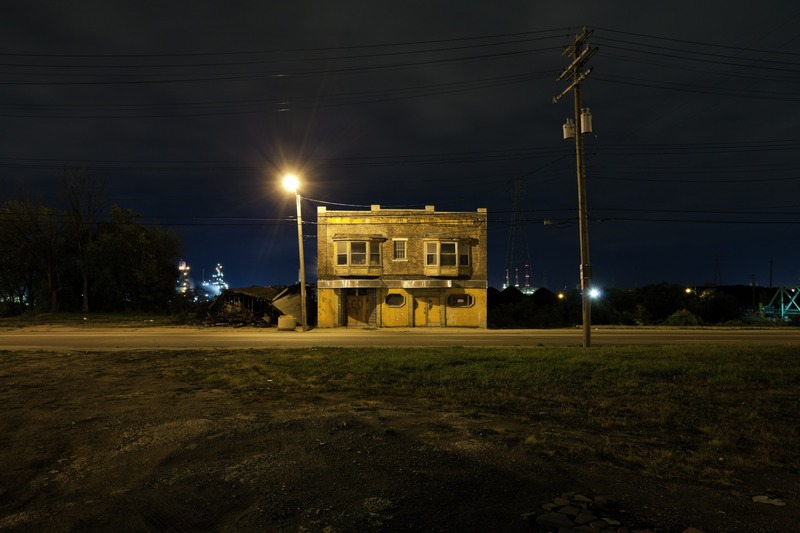 Scott Hocking, a Detroit artist who has created site-specific sculpture installations and a variety of photographic projects, provides the viewer with a stark image of a lonely building on Jefferson Avenue, formally centered with time exposure that provides a lit building against a Windsor backdrop. The exposure is possible because of the stillness in the frame. Detroit Nights is an ongoing project, documenting the streets, railroads, quiet corners and unpredictable public lighting of Detroit at night. In a statement, he says, “I am interested in forgotten places, and things kept out of sight. I don’t know if this is because I’m from Detroit, a city that has become known for urban prairies and empty factories; but I try to work the same way no matter where I am.” Scott Hocking is represented by the Susanne Hilberry Gallery. 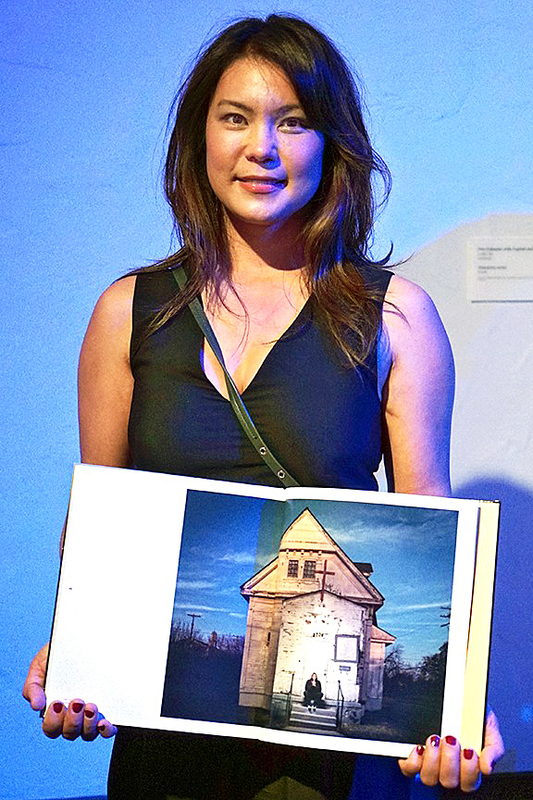 Jenny Risher, shown here holding her book with her photograph from the exhibition, is a commercial photographer with a collection of personal work. Known for her book, Heart Soul Detroit, where she interviewed and photographed 50 iconic Detroiters, including Smokey Robinson, Jack White Eminem and Lily Tomlin. Here in this image is Ms. Risher holding open her book, revealing the image from the exhibition, Mr. Porter. Dave Jordano first established himself as a successful commercial photographer in Chicago working with national print campaigns, before turning his lens to personal work here in Detroit. Jordano was born in Detroit and graduated from the Center for Creative Studies in 1974 with a BFA in Photography. 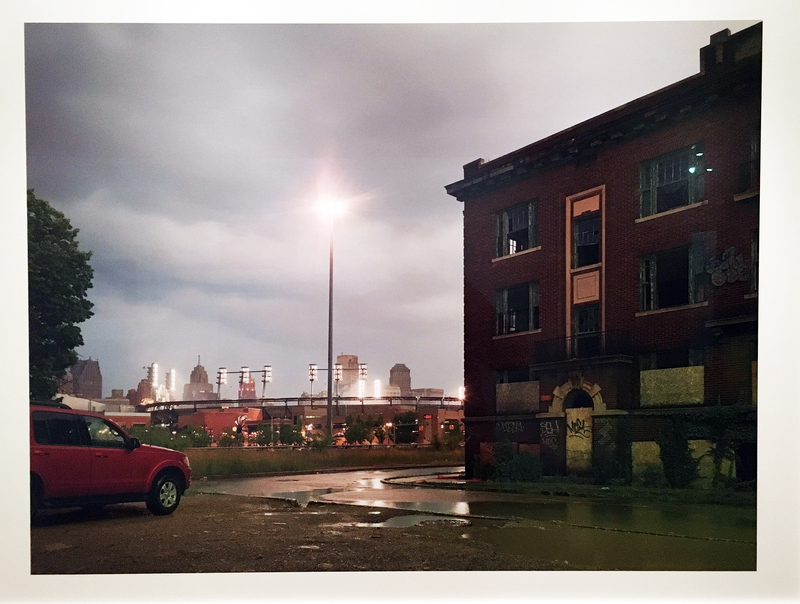 His large image, Abandoned Brush Park Building, dominates the exhibition with its scale depicting the contrast between this abandoned building and the lights of Comerica Park. 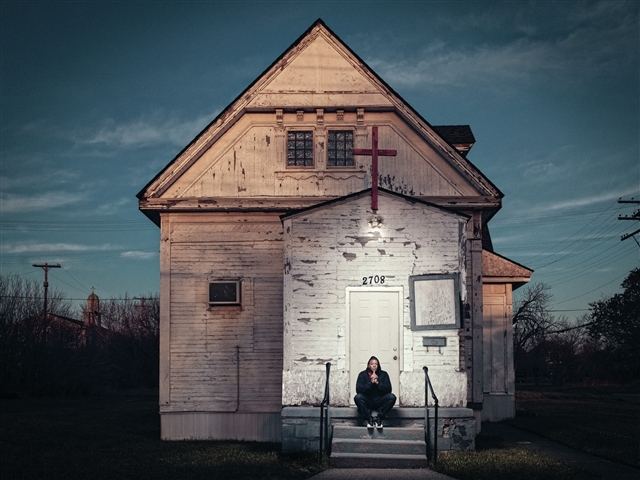 He says in a statement, “These photographs represent a visual document that speaks to the quiet determination of Detroit residents, both as independent shop operators and as home owners who have survived the long and difficult path of living in a post-industrial city stripped of economic prosperity and opportunity. These photographs speak truth without casting an overly sentimental gaze.” Like other photographers in Detroit, there seems to be a trend in capturing a still image using a tripod to provide the ability to depict a large depth of field and focus, highlighted by a light source. Exhibition free with regular museum admission. Admission to DIA is free for residents of Wayne, Oakland, and Macomb counties. Others: $12.50 adults, $8 seniors, $6 ages 6-17. The prevailing stereotype of Detroit’s ’60s and ’70s iconic Cass Corridor art scene is misleading. Images of beer-swigging, dope-smoking, post-adolescent boys, spitting on studio floors and recycling beer cans into expressionistic, assemblaged sculptures with which they hoped to violate the hallowed halls of the Detroit Institute of Arts come to mind. It was a myth created by romantic souls who tried to rescue bohemia from Detroit’s growing derelict landscape. Of course there was also a considerable population of heady, intellectual /artist types who cowed up around the Detroit Institute of Arts, read books, went to arty films, listened to music other than the MC5, even went to the opera and had jobs too. Artist Jim Crawford who has a mini-retrospective at Trinosophes, a performance space in downtown Detroit, seems like he could have been one of those. Crawford’s art is marked by a psychologically reflexive interiority—it occurs more in the mind as noumenon than as object or phenomenon—and makes what seems an ordinary material world into the extraordinary. Simple gestures or processes, replacing the traditional romance of creating a single object, are repeated and accumulated to explore a sense of time and evolved change, and to challenge our perception in an artistic process sometimes referred to as Conceptual Art. 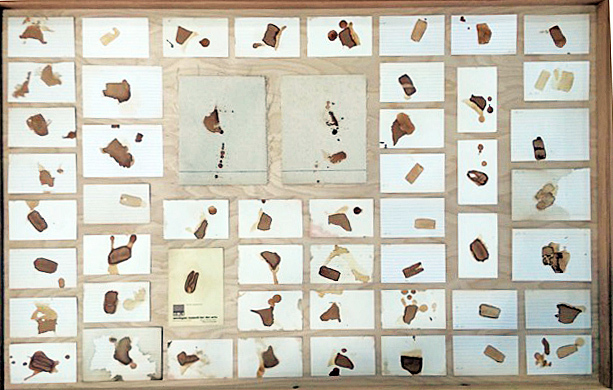 In 1970, in a beautifully measured and meditative ritual production, Crawford translated his daily cups of tea at his job at the Michigan Council for the Arts into a very deliberate series of over one hundred tea bag stains on 3”X5” cards. In the Trinosohes gallery, the tannic-colored blots have been arranged on a grid in two display vitrines to accomplish a stunning array of difference and signifying presence. Each stain records a moment with countless daily variables (temperature, emotional presence, gravity, haptics), or what acute perception can distinguish, becoming a sign of those variable influences as much as a thing to perceive in itself. Like many artists Crawford works serially, and the Trinosophe exhibition features six main series that he has explored from the late ’60s until now. 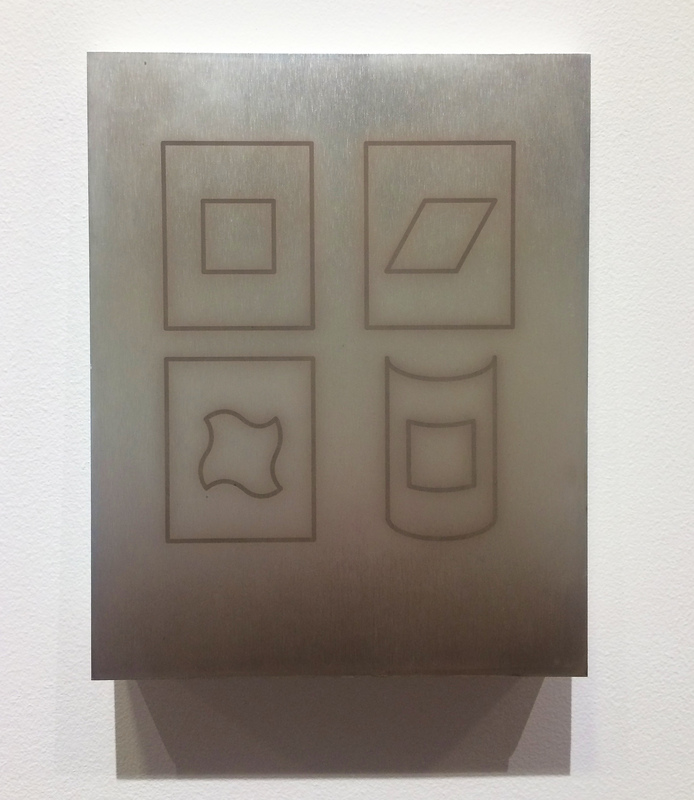 The most conventional form in the exhibition (created in the early ’70s, and of which seven individual examples are exhibited) is composed of sheets of paper folded into flat, randomly occurring geometric shapes, punctuated with staples, and marked or patinaed with graphite or paint. Created to be two-sided, they are a unique composition like nothing else: resembling geometric clouds (each is magnificently unique, but best experienced together so go see the show), and apprehended or readable more as signs than as objects. As in the best of human productions, the materials have dictated the form. In a public interview at the gallery, Crawford quipped, “I had a long staple gun,” allowing staples to reach and punctuate everywhere on these manipulated forms, depositing dash-like marks, leaving shadows and an almost musical notational presence. The scribbled or shaded graphite illuminates and posits a “natural” surface (think birch bark); and the creases of the folds give the pieces a sense of volume and mass, but therein lies the challenge. They suggest dimensionality or objectivity, yet are ultimately inscrutable, seductively flat signs, abstracted and void of referent. 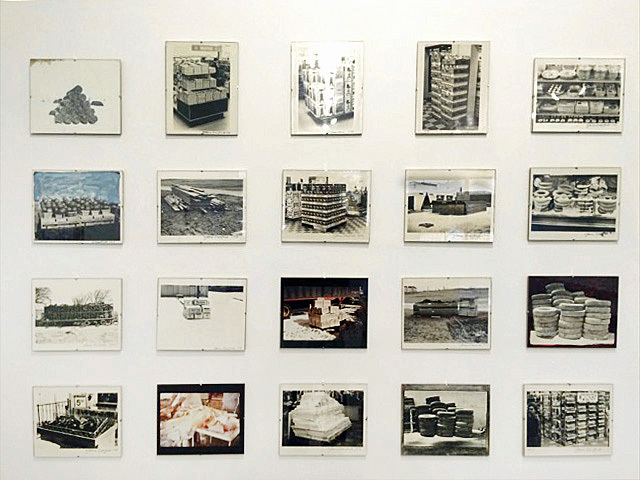 There is also a suite of photographs that document what Crawford has called the “Pile Series; discovered throughout the city, they record the presence of piles of various industrial or commercial materials that seem, through Crawford’s discerning eye, to achieve the status of sculpture. No doubt he has positioned these twenty images to both serve as ironic description of the identity of the artist (suggesting perhaps that art challenges perception, enabling it to discern “found objects” or objets trouvés as art, thus emphasizing the prominent part that ideas and concepts play in perception), as well as to call attention to the compelling nature of our landscape, and to create a dialogue that compares art to the supposed randomness of everyday material reality. 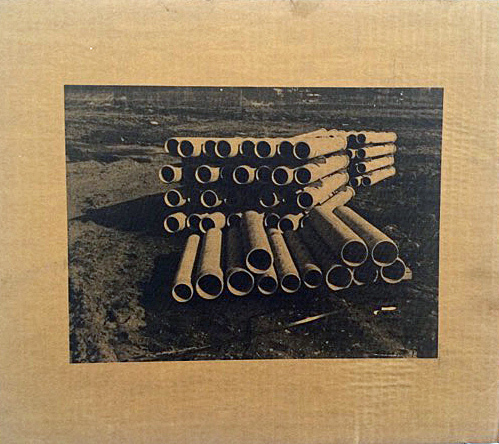 Included in the series are photos of stacks of snow fence, old tires, boxes of fruit, and lumber at a construction site. Each of the photos reveals the particular effect that weather, light, and context play in conditioning both the appearance of the particular stack and our perception of it. The raw quality of the 40-year-old 8”X10” black and white photos and derelict framing of them adds a certain historical charm to the project. Two recently created series echo Crawford’s earlier strategies for dealing with recycled materials with an emphasis on personal biographical influences. Inspired by his grandmother’s practice of reading tea leaves at the kitchen table, Crawford, while cooking, has recycled cracked egg shells back into their cartons to produce stark abstracted images of the roundness of eggs. Like his grandmother’s tea leaves, the organic byproducts of his everyday life have become signs: a circle in a square, an egg in a carton, dyed with walnut stain from his walnut tree — painted and decaying they are ever changing and evolving. 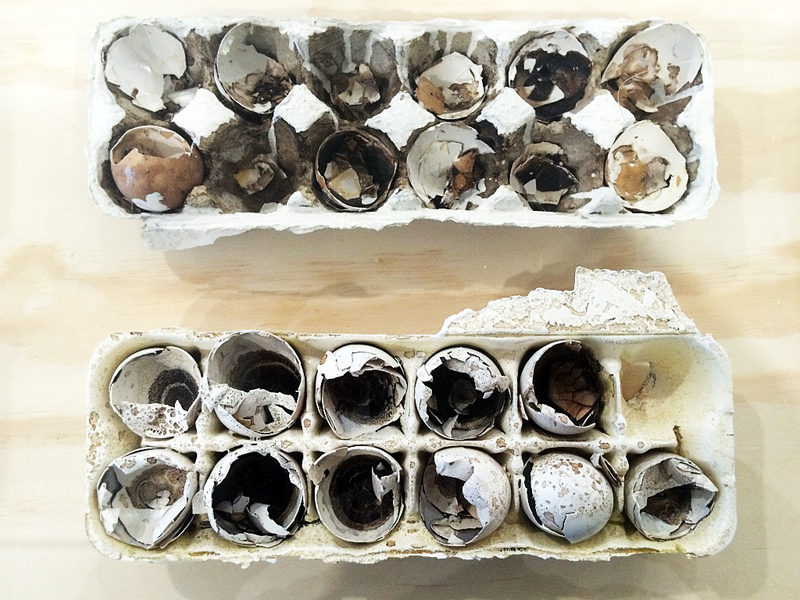 The delicate egg shells may at first appear as mere garbage or waste, but emerge with a powerful, though fragile, talismanic presence. In another series, Crawford has engaged Midnight, a stray black cat that wandered into his garden, to create the Cat Can Series. 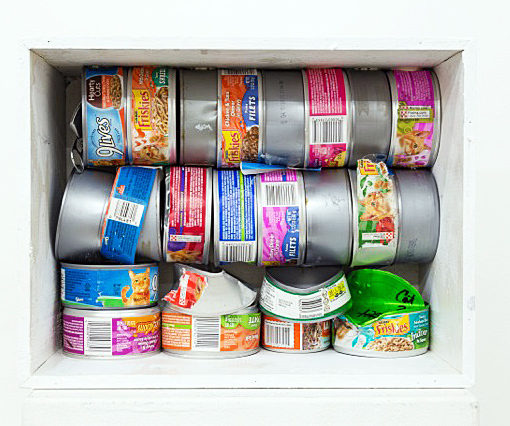 “An unlimited supply” of cat food cans from feeding Midnight becomes the material for a somewhat awkwardly stated, perhaps eccentric arrangement of aluminum cat food cans in various conditions: some painted or stained green (Midnight’s eye color), some crushed, some with labels intact (9 Lives and Friskies being the preferred brands), and all enclosed in boxed frames. Employing the same stacking gesture as the early 1970 series, Crawford resuscitates the theme of exploring the visual landscape for architectonic structure. In wandering through Xavier’s modernist furniture store on Michigan Avenue in Detroit, Trinosophe’s co-director Rebecca Mazzei, along with Joel Peterson, ironically found a stack photos that intrigued her. Pursuing the maker of the photos, she rediscovered the seemingly forgotten artist and art of Crawford. In researching, organizing and designing the exhibition “Jim Crawford,” she has energetically brought to our attention one of the most intriguing figures of the Cass Corridor, one whose work challenges perception and through its changes translates time into evidence for the consideration of big ideas. The exhibition includes various support materials from Crawford’s own archives, such as a post card series and ring binders and files containing Crawford’s copious notations on his projects.